We currently don't have a streamlined process for deploying Chaos Monkey. This page describes the manual steps required to build and deploy. A great way to contribute to this project would be to use Docker containers to make it easier for other users to get up and running quickly. 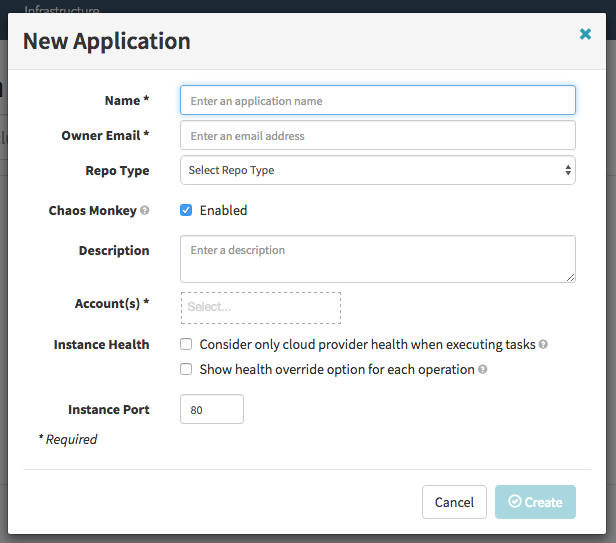 To use this version of Chaos Monkey, you must be using Spinnaker to manage your applications. Spinnaker is the continuous delivery platform that we use at Netflix. Chaos Monkey also requires a MySQL-compatible database, version 5.6 or later. To build Chaos Monkey on your local machine (requires the Go toolchain). This will install a chaosmonkey binary in your $GOBIN directory. Chaos Monkey does not run as a service. Instead, you set up a cron job that calls Chaos Monkey once a weekday to create a schedule of terminations. When Chaos Monkey creates a schedule, it creates another cron job to schedule terminations during the working hours of the day. Spinnaker's web interface is called Deck. You need to be running Deck version v.2839.0 or greater for Chaos Monkey support. Check which version of Deck you are running by hitting the /version.json endpoint of your Spinnaker deployment. (Note that this version information will not be present if you are running Deck using a Docker container hosted on Quay). If the feature was enabled successfully, when you create a new app with Spinnaker, you will see a "Chaos Monkey: Enabled" checkbox in the "New Application" modal dialog. If it does not appear, you may need to deploy a more recent version of Spinnaker. For more details, see Additional configuration files on the Spinnaker website. Chaos Monkey uses a MySQL database as a backend to record a daily termination schedule and to enforce a minimum time between terminations. (By default, Chaos Monkey will not terminate more than one instance per day per group). Note: Chaos Monkey does not currently include a mechanism for purging old data. Until this function exists, it is the operator's responsibility to remove old data as needed. See Configuration file format for the configuration file format. Chaos Monkey supports a number of command-line arguments that are useful for verifying that things are working properly. If it fails, you'll see an error message. You can verify that Chaos Monkey can reach the database by attempting to retrieve the termination schedule for the day. (Chaos Monkey will write an empty file to /etc/cron.d/chaosmonkey-daily-terminations since the database does not contain any termination schedules yet). You can manually invoke Chaos Monkey to generate a schedule file. When testing, you may want to specify --no-record-schedule so the schedule doesn't get written to the database. These are intended to allow an operator to make certain changes to Chaos Monkey's behavior without having to redeploy. Note: the configuration file takes precedence over dynamic provider, so do not specify these properties in the config file if you want to set them dynamically. To take advantage of dynamic properties, you need to keep those properties in either etcd or Consul and add a [dynamic] section that contains the endpoint for the service and a path that returns a JSON file that has each of the properties you want to set dynamically. Chaos Monkey uses the Viper library to implement dynamic configuration, see the Viper remote key/value store support docs for more details. For the remainder if the docs, we assume you have copied the chaosmonkey binary to /apps/chaosmonkey, and will create the scripts described below there as well. However, Chaos Monkey makes no explicit assumptions about the location of these files. Create a file called chaosmonkey-schedule.sh that invokes chaosmonkey schedule and writes the output to a logfile. Note that because this will be invoked from cron, the PATH will likely not include the location of the chaosmonkey binary so be sure to specify it explicitly. Once you have this script, create a cron job that invokes it once a day. Chaos Monkey starts terminating at chaosmonkey.start_hour in chaosmonkey.time_zone, so it's best to pick a time earlier in the day. The example below generates termination schedules each weekday at 12:00 system time (which we assume is in UTC).